(Bloomberg Opinion) -- General Electric Co. hasn’t turned the corner yet. The embattled industrial conglomerate released fourth-quarter earnings on Thursday, and they included bigger-than-expected shortfalls at the company’s biggest trouble spots: The power unit notched a $872 million operating loss and a $2.7 billion cash burn, while GE Capital recorded a $177 million loss. Conspicuously absent from GE’s earnings presentation was any guidance for 2019. On the company’s earnings call, CEO Larry Culp said industrial organic sales would grow low- to mid-single digits this year and that free cash flow would be under pressure before strengthening in 2020 and 2021, but said he would refrain from giving detailed projections until some point in the future. Apparently the “time and place” for guidance that Culp seemed to indicate would be forthcoming soon after he took over last fall is still a ways off. The company’s messaging continues to puzzle me. GE is trying to reinvent itself as a more transparent and accountable entity, yet the way it trickled out the details of its situation over the course of the call seemed to fly in the face of that resolve. Culp no longer gets a pass for being new to his job; he’s now been there for four months. Of course, any sort of guidance risks becoming a trap for Culp because investors have little patience for yet another GE shortfall. But the market was prepared to give him a shot at a true reset, with all the adjustments around restructuring and pension that have clouded prior guidance stripped away. His unwillingness or inability to do so suggests that a turnaround strategy remains a work in progress – particularly in the power unit, where GE took a $22 billion writedown last year, largely tied to its disastrous purchase of Alstom SA’s energy assets in 2015; fixing the business “will take time,” Culp said on Thursday. GE now expects to funnel $4 billion from the industrial parent to its GE Capital financial arm this year, about $1 billion more than its previous benchmark. This amount includes a $1.5 billion civil penalty that GE said Thursday it had agreed to pay to the Department of Justice to settle an investigation into its WMC subprime mortgage business. That settlement appears to be a major driver behind the stock’s early rally, but while removing a liability question mark is undoubtedly a positive thing, WMC wasn’t the part of GE Capital that investors were most worried about. Buried a few pages down in its press release, GE disclosed that it took a $65 million after-tax charge related to the legacy long-term care insurance operations based on its annual loss recognition testing. That’s a paltry sum compared to the $6.2 billion charge GE had to take on that business last year, but the company didn’t clarify the possible impact from new accounting rules set to take effect in 2021 that risk ballooning its reserve shortfall to a more significant extent and said a statutory reserve review is still in process. GE will fund additional insurance capital requirements or “strategic options” (a likely reference to a possible divestiture of the long-term care insurance business, where GE may need to pay a buyer to take the assets off its hands) via liquidity, asset sales and “parent support,” CFO Jamie Miller said, indicating the finance arm may continue to be a cash leech. Perhaps the most surprising announcement on the conference call was Culp’s declaration that GE has no plans to sell its GECAS jet-lessor unit. Bloomberg News had reported Apollo Global Management was talking to banks about lining up debt financing for a possible bid for all or part of GECAS, while the Wall Street Journal had reported Blackstone Group and KKR & Co. were interested as well. The inability to transfer debt as part of a purchase would have required a private equity firm to come up with enough cash to fund the entire purchase up front, which likely would have been a challenge. But GE’s decision to keep GECAS in the fold is likely more a reflection of the fact that it needs the earnings from that business to help support the liabilities at GE Capital. That GE Capital fourth-quarter loss would have looked much worse without the help of GECAS. And that’s really the heart of the challenge for GE. It needs to raise cash to bring down its bloated debt load, but it also needs earnings to support the debt that remains. GE’s industrial businesses generated $4.5 billion in adjusted free cash flow in 2018, down from former CEO John Flannery’s initial target of $6 billion to $7 billion. Free cash flow is likely to drop further in 2019 after adjusting for the divestiture of $20 billion in industrial assets. 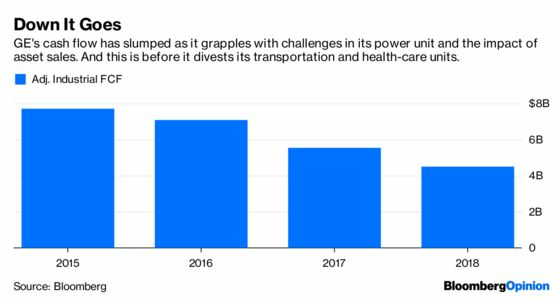 I’m skeptical of Culp’s promise for stronger free cash flow in 2020 and 2021, especially considering he intends to move ahead with a plan to sell as much as a 49.9 percent stake in GE’s cash-flow generating health-care business via the public markets. All of these numbers are before taking into consideration what is likely negative cash flow at the GE Capital financial arm, after backing out gains from asset sales. 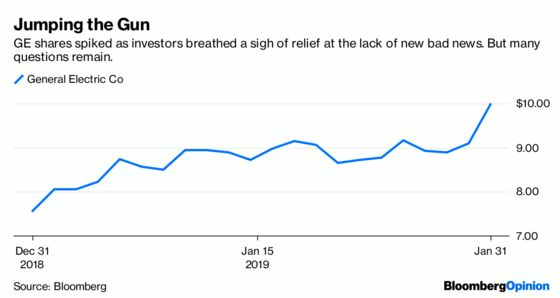 One good thing about Thursday’s news: It didn’t include any ugly surprises, like the $15 billion insurance shortfall it dumped on investors last year, or the goodwill writedown in power. When asked about any remaining skeletons, Culp said he could never promise that the company had found them all. Most of the bad news is probably out there. But either way, GE still hasn’t provided enough of a road map for how and when it will deal with the issues that are known.